JK's Galleria of Vintage, Classic and Pristine Cars is honored to present a most breathtaking example of pure vehicle design decadence...this is the vehicle of dreams!. Attributes: 2015 Dodge Viper - V10 Engine Sports Car The heart and soul of the 2015 Dodge Viper is its hand-crafted, all-aluminum mid-front located 8.4L V10 engine. This manual-controlled serpent of the road generates 645 horsepower, an increase over previous models, and twists out 600 lb-ft of torque. 2015 Dodge Viper - V10 Engine Sports Car Also the look of the 2015 Dodge Viper is unforgettable. The Viper is designed for maximum aerodynamic efficiency and high-speed balance while retaining many of the characteristics that made it an iconic supercar. The familiar lines of broad shoulders, carbon fiber hood, roof and decklid blend with aluminum door and sill panels for a truly dynamic look. 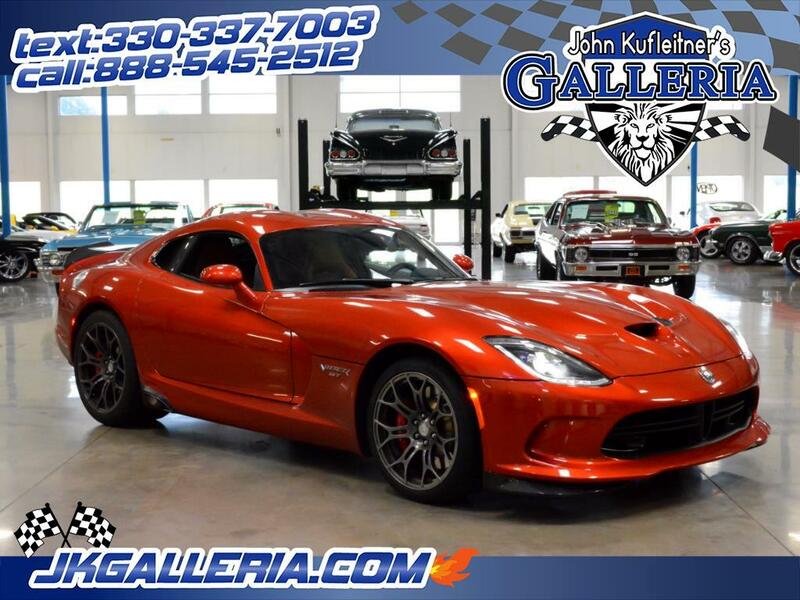 2015 Dodge Viper - V10 Engine Sports Car Race-inspired, high-performance, driver-oriented interiors feature superior craftsmanship, premium materials and performance-oriented technologies. The interior dash panel on every Viper is hand-wrapped in fine leather while the standard high-performance racing seats from Sabelt feature a lightweight shell for mass reduction and long-term durability. 2015 Dodge Viper - V10 Engine Sports Car The world is at your fingertips with the Uconnect 8.4AN System, featuring an 8.4-inch touchscreen, GPS Navigation, HD Radio , Voice Command, Hands-Free Calling +, Bluetooth Streaming Audio and available Uconnect Access + with downloadable apps, mobile access, Wifi Hotspot + and standard SRT Performance Pages. Also remember we can facilitate shipping right to your door. We also take anything of value on trade and can obtain financing with almost new car rates and terms up to 144 months!! What that means is the car of your dreams can very easily turn into a reality! Message: Thought you might be interested in this 2015 Dodge Viper. General Disclaimer: All vehicle descriptions are based on information that is to the best of our knowledge. The seller shall not be responsible for any incorrect description, authenticity, genuineness, or defects. Although we do our best to explain each car accurately, these are up to 50 year-old vehicles and there are no perfect cars, please keep this in mind when making your purchasing decision. Any descriptions or representations are for identification purposes only and are not to be construed as a warranty of any type. All vehicles are being sold as is with no warranty expressed, written or implied. It is the sole responsibility of the buyer to have thoroughly inspected the vehicle and to have satisfied their self as to the condition and value. The buyer accepts responsibility for all defects known and unknown by the seller at the time of sale. The seller shall and will make every reasonable effort to disclose any known defects associated with this vehicle at the buyers request prior to the close of sale. The seller is not and should not be considered experts on every make, model and variation of classic car that we make available for sale. They are not new cars. Most vehicles offered for sale are up to 50 years old, some are 60-75 years old or more, and as such, have long since exceeded their original life expectancy, and mechanical tolerances. If you drive them, they may break and require mechanical repairs. Seller assumes no responsibility for any repairs regardless of any oral statements about the vehicle. The seller assumes no responsibility or liability for any typographical errors that may be found in our advertising. All prices exclude tax, tags, title and all other motor vehicle fees. Photo Disclaimer: Due to the inconsistencies of various display monitors, the colors you see on your screen may not be a totally accurate reproduction of the actual product. We strive to make our colors as accurate as possible, but screen images are intended as a guide only and should not be regarded as absolutely correct. The images are reviewed for accuracy before being placed on the website. Every computer has different color settings. We are not responsible for the color settings on your system. Slight differences in color hue between the website and the physical item is possible. Images are taken with a high quality, digital camera. All pictures are from stock and no touch ups are made. Payment Disclaimer: Payments based on A+tier credit, 720 FICO score or better. Payments are figured at 6.99% financing with 15% down plus tax, title, & all applicable dealer fees. financing at the Max term. EXAMPLE: Using 6.99% $10,000 - $24,999* @ 84 months $25,000 - $49,999* @ 96 months $50,000 - $99,999* @ 120 months $100,000+ @ 144 months Unit must qualify. ** Lower interest rate may apply for those who qualify see dealer for details! !